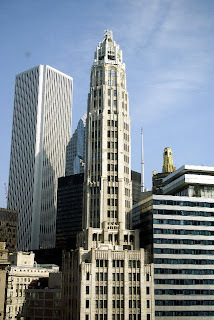 Various skyscrapers in Chicago. Do you rate them with a score or do you identify each one's singularity? Regarding wine education, arguably the most unfortunate and regrettable tool introduced over the past 25 years has been the 100-point scale for rating purposes. First used by Robert Parker at The Wine Advocate and then at The Wine Spectator (and now hundreds of wine publications around the world), this system replaced the 20-point scale that was in use for decades. Admittedly, the 100-point scale is easier to understand for almost everyone than the other system (90 points for a wine is far simpler to comprehend than 17 points), yet I find it ironic that the 100-point scale has in essence, become a 20-point system itself. After all, does anyone treat a wine below 80 points with any seriousness today? And how many wines do you even read about that receive less than 80 points these days? That score is based on mathematics as is a batting average in baseball and you can easily arrive at these numbers. What’s more, you can’t argue the math; if a baseball player has 30 hits in 100 at bats, that’s a .300 batting average – no more, no less. But what does it mean if a wine receives a score of 92? More to the point, what’s the difference between a 92 and a 93? Going back to the baseball analogy, if a player with 100 at bats has 31 hits, then his average is .310, while the player with 30 hits per 100 at bats has that .300 average. So the higher batting average is based on math. But more often than not, the reason one wine gets a 93 instead of a 92 is based on the writer breaking a tie. Of course, that’s the American way- we have to list things in order of importance or rank. I agree that consumers need guidance, but why do we need these specific numbered scores? What’s wrong with putting a group of wines into a particular category, such as very good, excellent or outstanding? Give the wines a star rating as with restaurants or a movie. Sure some people would disagree with that rating, but that’s fine – everyone has their likes and dislikes. But everyone would understand the difference between very good and excellent. I’m not so sure consumers (or even most wine professionals) understand the difference between 92 and 93 points. So much for the ease of numbered scores. The other problem is the induced meaning of the score. Most publications reward higher scores for more intensity, deeper color and more extract; in other words, bigger is better. Well as one winemaker in California once told me, “Bigger isn’t better, bigger is different.” Amen to that! We’re all free to like or dislike what we want, so don’t tell me that a more approachable wine that is a bit lighter on the palate is less of a wine. Generally, I prefer more drinkable wines, especially as they work better with food. That’s why I drink wines and that’s why I think most people drink wines. To me, if wines existed in a vacuum, numeric scores would make more sense. Then you could judge a wine simply on the merits of which is the biggest or boldest. But since wine is meant for food, then we need to look at balance in a wine and not power. Then of course there are wines that have nothing to do with power. Try a beautiful Greco di Tufo from Campania or a tangy Sauvignon Blanc from Chile or New Zealand. Does someone choose one of these white wines because they are searching for power? No, they look for a well-made, balanced white that is delicious and has good varietal character. That means that the most influential wine publicaions rarely rank white wines such as these with big scores. But why not? Shouldn’t a beautifully made, complex white get 92 or 94 points (assuming we’re stuck with this rating system) just like a big red wine? Of course they should, but it rarely happens, thanks to the caste system of most publications that equates powerhouse reds with the highest scores. I bring all of this up as an introduction to a wine I tasted last week that I loved. 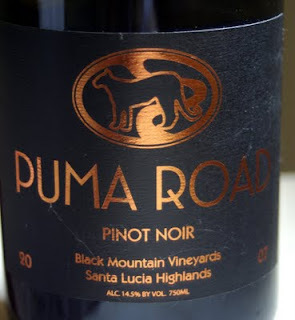 It’s a wonderful Pinot Noir from a new producer in Monterey’s Santa Lucia Highlands; the 2007 Puma Road “Black Mountain Vineyards” bottling ($40 retail). It’s a new project from Ray Franscioni, who owns several gorgeous Pinot Noir vineyards in this appellation. For me, there are a few areas in California that are ideal for great Pinot Noirs with beautiful varietal character, lively acidity and distinct spice; Russian River Valley and the far western reaches of the Sonoma Coast appellation in Sonoma as well as Sta. Rita Hills in Santa Barbara County are among those select zones and so is the Santa Lucia Highlands district. My notes specify the distinct characteristics of this wine, especially in its notes of brown spice such as cumin and cinnamon. This is a wine redolent of West Indies spice, so think of the foods it would work with; I’d love this with grilled lamb or pork or vegetarian dishes with eggplant or zucchini. So my rating of this wine is all about its special character and complexity as well as the array of foods it would accompany. That’s my rating and it has nothing to do with points. How could you award a specific point rating to this wine and do it justice? This wine isn’t about power (although it is a big wine); it isn’t about finesse (although it is an elgant wine); it’s about the spiciness that sets it apart. This isn’t a simple Pinot Noir with pleasant cherry fruit that you pair with duck with cherry or orange sauce. Rather this is a particular wine that needs a particular pairing. You can’t discover that with a numbered rating. There are countless wines such as this and this is just the latest I’ve tasted. So forget the scores and dig a little deeper. Learn what the flavors are of a specific wine and then pair it with the proper foods. You’ll enjoy both the food and the wine even more when you do it this way!